We provides ProPTT2 SDK for you. You can embody custom IP-PTT service environment for large organizations / enterprise clients who want to build their own system. by using ProPTT2 SDK, SI/Solution development companies can add video/voice Push-To-Talk function on their client application or they can develop a new ProPTT2 client application on demand. 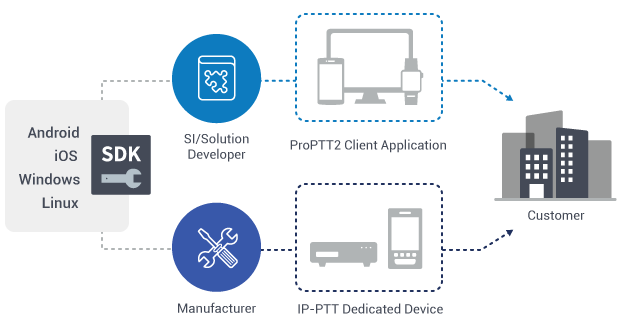 Manufacturers can produce IP-PTT Gateway device or IP-PTT dedicated devices using SDK.